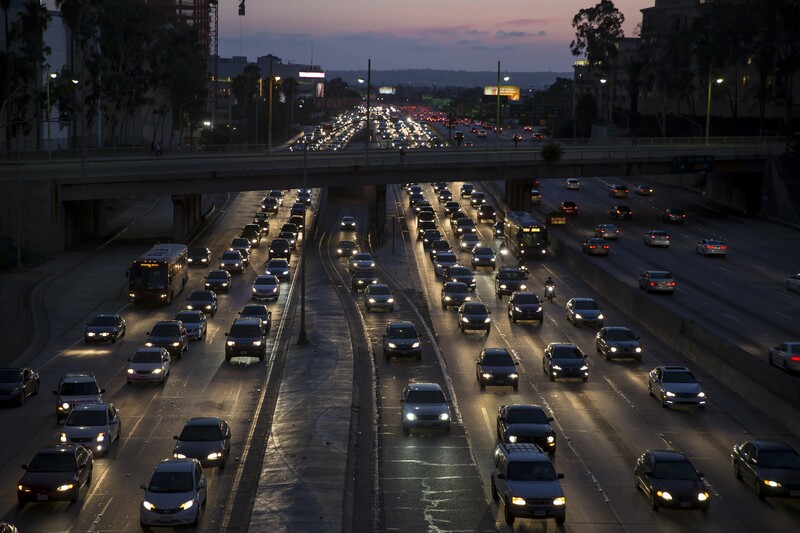 Evening rush hour traffic on the Interstate 110 in Los Angeles, Sept. 2, 2015. The Trump administration on Aug. 02, 2018, formally announced its long-awaited proposal to dramatically weaken an Obama-era regulation on planet-warming vehicle tailpipe pollution. The proposal would freeze rules requiring cleaner, more efficient cars. WASHINGTON — President Donald Trump’s proposal this week to weaken fuel-efficiency standards for cars and light trucks could be his most consequential climate-policy rollback yet, increasing greenhouse gas emissions in the United States by an amount greater than many midsize countries put out in a year. Assuming the plan is finalized and survives legal challenges, U.S. cars and trucks would emit an extra 321 million to 931 million metric tons of carbon dioxide into the atmosphere between now and 2035 as a result of the weaker rules, according to an analysis by the research firm Rhodium Group. Transportation now accounts for one-third of U.S. carbon-dioxide emissions, surpassing power plants as the largest source, and have been steadily rising over the past few years. Federal fuel-economy standards were widely seen as a vital tool for curbing gasoline use. The original Obama-era standards would have required automakers to roughly double the fuel economy of their new cars, pickup trucks and SUVs by 2025, putting out vehicles that would average roughly 36 mpg on the road. The Trump proposal would halt the rise of those standards after 2021, when new cars were expected to average around 30 mpg. There are, however, a few important factors that could counteract the climate impact of the Trump administration’s rollback, assuming that it survives any court challenge by California and other states and becomes final. First, if oil prices increase significantly over the next decade, then many drivers might opt to buy more efficient vehicles regardless of what federal standards require. Second, states could try to enact other fresh policies to try to cut emissions from the transportation sector and blunt the impact from Trump’s rollback. California and New York, for instance, have been offering tax breaks for people to buy electric vehicles, and they have been investing hundreds of millions of dollars in new charging infrastructure. The automakers themselves are another wild card. While many manufacturers have been developing new electric car models in response to the ever-rising fuel economy standards, it’s not clear how many would completely pull back if the standards were frozen.